…this is no ordinary man, this Franz Biberkopf. I did not summon him to entertain us, but so that we might share his hard, true and enlightening existence. The plot and style have been admirably assessed in several places: I’d recommend Max’s typically perceptive account at Pechorin’s Journal here. He summarises the (rather basic) plot and themes: the downward trajectory of the life of Franz Biberkopf, ‘an erstwhile cement-and –transport-worker in Berlin’. At the novel’s opening he is released from Tegel Prison after serving a four-year sentence for the manslaughter of his girlfriend. He resolves to go straight – but the narrative relates his stuttering attempts, and ultimate failure, to do so. After several menial jobs he falls in with gangsters, loses a limb in an act of treachery by his fellow burglars, and suffers more and more blows in his life. As Max points out, the plot is exciting enough in its way, but it’s the high modernist portrayal of Berlin in the decadent last days of the Weimar Republic that’s its most compelling feature. That, and the style, something between middle period Joyce and the Dos Passos of USA: montage, collage, snippets of classical literature, popular songs, ads on billboards, anything that surrounds Franz in his peripatetic quests across and beyond the city. It’s not a cheerful or easy read. Like Emma of Book Around the Corner I found it heavy going. Just as I started to weary of the fragmented style, however, the pace changed and my interest revived. So let’s take a look at the style. As Max has already commented on the fragmentation technique, I’d like to just add a couple of features that stood out for me. Aha, they are building an underground station, must be work to be had in Berlin. Another movie. This is Franz’s stream of thought as he stands on a corner in front of a movie theatre. The scene of typical urban renewal sparks off thoughts of a possible job, but the movie intrudes and interrupts the flow. This is largely how we all experience our interior monologue, I’d have thought, and it works quite well, but tends to irritate me after several pages of it. Tenses jump around for no apparent reason from past to present and back. Pages 41-42 contain a sequence of symbols for Trade and Commerce to Finance and Tax Office; these are reminiscent of Laurence Sterne’s insertion of bizarre symbols in Tristram Shandy, and serve no particular purpose here, as far as I can see. He is not against the Jews, but he is for law and order. For law and order must reign in Paradise; which everyone should recognize. And the Steel Helmet, he’s seen those boys, and their leaders, too, that’s a great thing. [There follow sickening extracts of fascist rhetoric from the paper] In the Elsasser Strasse the other fellows laugh themselves sick when he makes his appearance in the café at noon, his Fascist armband discreetly tucked in his pocket; they pull it out. Here it’s possible to see the other problem with the text, apart from its modernist liking for cinematic verbal metonymy: the clunky translation. It has to be said, given the fact that the novel is apparently filled with Berlin dialect and thieves’ argot, that translation must be a nightmare. 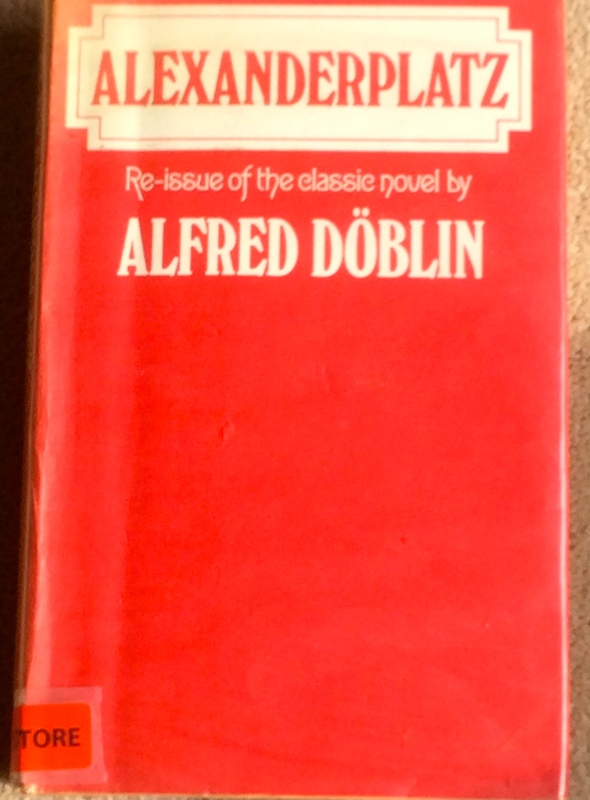 This UK-published edition was translated by the American-born Eugen Jolas (died 1952), who uses a register that swings oddly from prohibition-era New Jersey to Edwardian English (‘What the deuce are those big boots?’ asks one character, implausibly). I’ve found it hard to pin down what I ultimately made of this novel: it’s a considerable achievement, and certainly a notable addition to the canon of experimental modernist European fiction. But I can’t say hand on heart that I particularly enjoyed it. I’d be quick to concede that it’s probably more to do with my defects as a reader than those in the text. 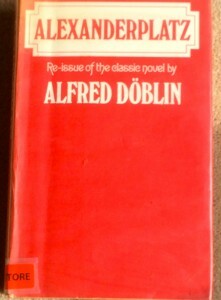 Edition used: Secker and Warburg, London, 1974, first published by Martin Secker in 1931. Thanks to Cornwall Libraries for the loan of their copy.